"How can you go on living, after causing all these peoples' deaths? Please answer me!" The adventures of young inventor Jean and mysterious acrobat/princess Nadia (together with lion cub King) and little orphan Marie continue, as does the pursuit of nearly everyone for the Blue Water, the jewel Nadia wears as a pendant. The story is placed in settings from Jules Verne's classic 20,000 Leagues Beneath the Sea, though as usual extreme liberties are taken with the source materials. When the Nautilus stops at an island for supplies, little Marie and baby lion King get separated from the rest of the crew and end up pursued by Gargoyle's men. Nadia and Marie both fall victim to a tropical fever that threatens their lives. Soon afterward, the Nautilus takes on one of the Gargoyle's ships in battle, and suffers heavy damage. When they surface to repair the submarine, the American fleet, warned by the Gargoyle is waiting for them and opens fire. A visit to the lost city of Atlantis is present as well, in one of the few nods to the original source material. Along the way secrets are revealed about Jean's father and the source of the technology on the Nautilus. This volume of episodes finally gives the viewer some substantial content that one would expect from the creators of Neon Genesis Evangelion. Characters are nicely developed as Marie bonds to Grandis' henchman Sanson, and Jean bonds a bit to Hanson. 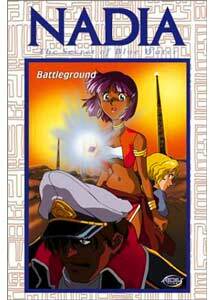 Nadia becomes more bitter and withdrawn, and substantive discussions of morality are featured without slowing down the story or losing the viewer's interest. Topics such as vegetarianism vs. meat-eating, the moral imperatives of war and self-defense, and sacrifice of the few for the good of the many are dealt with in sensitive and often moving ways, though Nadia herself often comes off as a bit on the whiny side. Still, it's not ordinary kiddie cartoon fare, a welcome change from the attitude of the first three volumes. Particularly notable is the transformation of Jean over this arc of the story. Initially totally enamored with the technology of the ship, he becomes devastated when it cannot save Fait, one of the engineers he has befriended. In a sequence reminiscent of the climax of Star Trek II, but a good deal more moving, Jean must deal with the choices that are involved with sacrifice. The Japanese voice acting here is quite exceptional and one of the very highest points of the series thus far. We also get more depth to Nemo's assistant, Electra, and get a view of her conflicting motivations. Again, this is a welcome change from the rather colorless portrayal in the first three volumes. It looks as if things are picking up for this series. Image Transfer Review: The image is quite nice indeed. There are the usual speckles and dirt, but again, these are obviously part of the original cels and thus part of the original image. I suppose a digital cleanup could have been done, but the picture is overall satisfactory. Color is outstanding and the line work is crisp and clear. The presentation is, however, interlaced video and not coded for progressive viewing, so it's not quite all it could be. Audio Transfer Review: Both the English and Japanese tracks are presented in 2.0. There is occasional quiet surround activity (almost entirely background music), but the program is very center-oriented. The audio is free of hiss and noise, and dialogue is clear throughout. The music has excellent range and tough somewhat lacking in bass extension. The audio is quite pleasing overall. Extras Review: The extras are scant. One-screen character profiles for Nadia, Jean, Marie and King are included, as is a preview of vol. 5. Wrapping up the package are brief and generally cryptic previews of Soul Hunter, Princess 9, Original Dirty Pair, New Kimagure Orange Road, Arc the Lad and Dai Guard. Again, nothing to get excited about. The layer change is properly placed between episodes 14 and 15. Containing a more thoughtful and serious group of episodes, this disc finally rights the ship and moves the story forward with substance. The transfer is very good, as usual. Again, little for extras.